Baptist was born on 17th April 1447 to a family of civil servants to the Dukes of Mantua. Heentered the Carmelites of the Congregation of Mantua 1 at Ferrara as a young man. While not a poet of genius, he was a superb Latin stylist, imitating Virgil. His eclogues (poems in a classical style on a pastoral subject) were used in European schools for a century and a half after his death as a model of style and he was quoted by Shakespeare, Boswell, and Nashe. He made his religious profession in 1464 and served in many positions of responsibility in the community in addition to his literary work. Baptist performed a number of diplomatic missions for the popes; he was vicar general of his congregation six times and in 1513 he was elected Prior General of the whole Order. He was a renowned humanist who brought his richly varied poetry into the service of Christ. 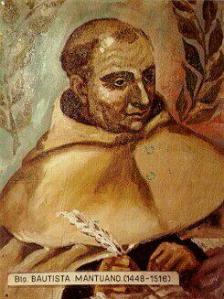 He is the only Carmelite quoted in the works of William Shakespeare (Love’s Labor Lost, Act IV, scene 2, line 95ff.). I have often wondered why the scriptures have this persuasive power, why they have such a powerful effect of those who listen to them, and why they lead us to the commitment of faith and not to the mere forming of opinion. This response of faith does not happen because of a reasoning process, because scripture does not offer one; and it is not a matter of literary style or artistic merit, because scripture does not use these devices; nor does it use soft words to persuade us. acceptance: the greater the truth, the greater its power. So why is it, then, that not all believe the good news? My reply is that not all are drawn by God. However, there is no point in arguing further.